First introduced in Unstoppable Learning, the Unstoppable Learning framework details seven essential elements of teaching and learning: (1) planning, (2) launching, (3) consolidating, (4) assessing, (5) adapting, (6) managing, and (7) leading. 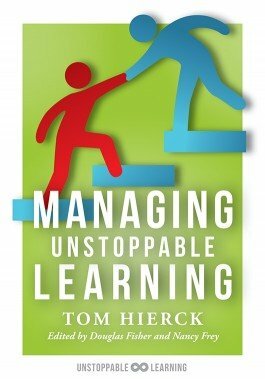 This resource by Tom Hierck focuses specifically on the element of managing learning outcomes in the classroom environment, outlining a collective approach to behavior management strategies and student engagement that minimizes the impact of negative behaviors and maximizes the potential (as well as the social and emotional learning) of each student. Review the Unstoppable Learning framework originally laid out by Douglas Fisher and Nancy Frey. Closely examine how to manage student behavior and classroom climate using the Unstoppable Learning framework’s proven approach. Become familiar with classroom management strategies for creating a positive learning environment, developing teacher-student relationships, and dealing with problem behaviors. Benefit from summaries of key points at the end of each chapter, as well as questions for reflection. Access free reproducibles designed for reader reflection on classroom behavior management strategies.